There is an old joke that you become a buy and hold investor when a trade doesn’t work out the way you expect. 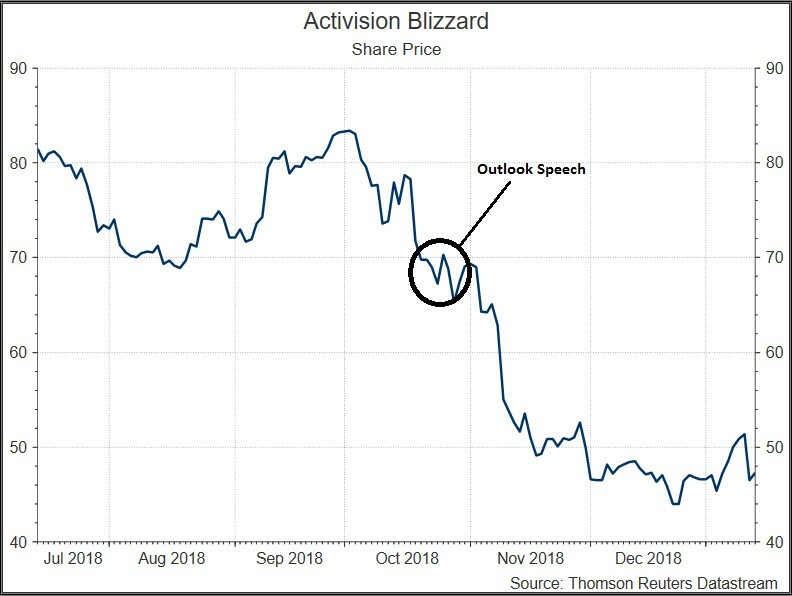 During our Outlook 2019 meeting, I presented Activision Blizzard as a well-run company that would benefit from some significant long-term trends such as mobile gaming and eSports. In fairness, the stock market as a whole was also down significantly throughout the last few months of 2018 with tech stocks as a whole faring even worse; shares of leading technology companies such as Apple, Netflix, Amazon, and Facebook all dropped at least 20% during this time period. Shares of Electronic Arts (another major video game publisher) are also down 25%. Still, a loss is a loss, and this is as good a time as any to re-examine our thesis. As I previously wrote, the appropriate reaction to a declining share price depends on the underlying cause. Did we misjudge the quality of the business? Did we overpay? Or is the market simply being irrational? These are not mutually exclusive questions. My colleague Benjamin Klein reminds me of the human tendency towards confirmation bias, so the first step should be to review your arguments when initially researched. In my original report, I observed that CEO Robert Kotick was an exceptional CEO who simply knew how to make money and position Activision Blizzard to take advantage of growing trends such as eSports. Activision Blizzard also had a clean balance sheet, and a history of using it on an opportunistic basis. I had also noted that while the valuation was reasonable, it was certainly not a bargain, and that companies like Activision Blizzard will have lumpy performance given the hit/miss nature of video games. Since then, what are some of the events that have happened? On November 6, Activision Blizzard announced mobile game Diablo Immortal to a strong negative reaction from fans of the Diablo series. On November 8, Activision Blizzard missed analyst expectations and announced a decline in active players. On January 3 and 4, Activision Blizzard lost two key executives: Spencer Neumann, CFO of Activision Blizzard, went to Netflix Inc., and Amrita Ahuja, CFO of Blizzard Entertainment, went to Square Inc.
On January 10, Activision Blizzard announced that Bungie was ending its contract for the Destiny franchise and transferring publishing rights to Destiny back to Bungie. It is hard to really draw any long-term conclusions from this. Video game and movie fans can be notoriously opinionated on the smallest details, but the loudest naysayers are often the first in line upon release. We will have to wait until the game actually launches. This is obviously not good news, but digging a bit deeper, we see that all of the sequential decline in players came from the King segment, which makes mobile games such as Candy Crush. Within King, a tiny minority of players, around 3%, generates 100% of the revenue and profits, so the number of active users is not a hugely important metric. What matters much more is the ability of King to retain and monetize from the players who do decide to pay. Another thing to keep in mind is that two key games (Call of Duty: Black Ops 4, and Candy Crush Friends Saga) were released in October after the end of the quarter. During our research, one of the things that impressed us about Activision Blizzard’s management was their ability to maintain profits in the face of a declining user base (make more money from those who stay), while creating popular new franchises to replace old ones. For example, World of Warcraft was formerly the Blizzard segment’s most important game, making up 80% of segment revenues. By 2015, World of Warcraft had lost half of its active subscribers but Blizzard’s profitability today is much higher given the release of new games such as Overwatch and Hearthstone. Going back further, we see that Activision Blizzard’s track record of developing new games has been excellent. For the long-term investor in Activision Blizzard, what matters is the ability to innovate and replace dying franchises with new ones while managing the lifecycle of existing games. Again, there isn’t really much to analyze here. People switch jobs all the time for many reasons. Certainly Netflix and Square are “hot” companies to work for today. CFO Spencer Neumann had only been with Activision Blizzard for around a year and a half, so he was not really responsible for any major changes in strategy that have occurred. In the same vein, Ms. Ahuja had been the CFO of Blizzard Entertainment only since March 2018. Some context here: Activision Blizzard occasionally publishes games for 3rd party studios. These licensed video games tend to be less profitable for Activision Blizzard since the profits have to be split. In the case of Destiny, Activision Blizzard had an agreement with game studio Bungie to publish the Destiny video game series from 2010 to 2020. Leading up to the split, the recent performance of Destiny 2 had been mediocre with speculation that the contract would end in 2020, and the Destiny franchise overall had represented just 6-7% of Activision Blizzard’s revenue and even less of profits. From a financial perspective, Activision Blizzard’s revenue and profitability remain near all-time high levels; what has simply changed is the narrative of the stock. In the summer, the market was excited about Call of Duty: Black Ops 4 being the “Fortnite killer”. Today, the market is questioning the ability of Activision Blizzard to create new games. If there was anything to reflect on, it’s that we perhaps should have been more careful about the market narrative at the time we purchased the stock although this is in hindsight. So back to the original question… did we misjudge the quality of Activision Blizzard? Did we overpay? Or is the market simply being irrational? 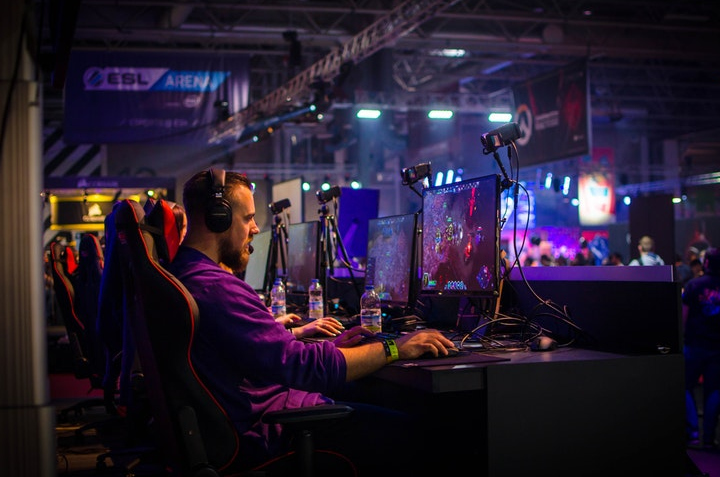 Given the evidence we’ve seen so far, our thesis has not been impaired in any way and we remain excited about Activision Blizzard’s future pipeline of video games and potential in eSports and mobile gaming. We also do not think that the price we paid at the time was excessive given the track record of product innovation and future growth prospects. The remaining possibility is that the market is overreacting to temporary headwinds, confusing the short-term with the long-term, and we are thrilled to purchase more shares of this quality company at the current depressed prices.